On December 10, 2008, ACES students were treated to a special event! 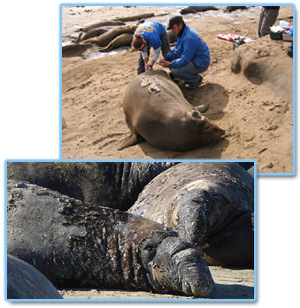 TOPP [Tracking of Pacific Pelagics] scientist Dr. Samantha Simmons gave a webcast in which she described the work of tracking Northern Elephant Seals and what she and other scientists have learned so far from the research. Hundreds of ACES students from across the country (California, Montana, Kentucky, North Carolina, South Carolina, New Jersey, and Massachusetts) logged into the live webcast to hear Dr. Simmons describe her work with these fascinating animals. During the first part of the presentation, Dr. Simmons described some basic life history information about Northern Elephant Seals. In particular, she described the 'catastrophic molt' that elephant seals endure, during which they lose all of their fur and skin at once. Another tough time for elephant seals females is when they are suckling their pups. For the first month of the pup's life, the mother seal does not eat at all, and consequently loses about 1/3 of her body weight in about 28 days! Males also go through fasting periods while on land - often for as long as 2-3 months. Dr. Simmons then described the field work that she and her fellow scientists conduct. 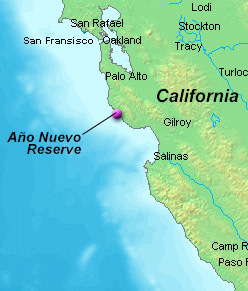 Very early in the morning, the research team heads to the field at Año Nuevo Reserve, where nearly 2,500 Northern Elephant Seals breed each year. In addition to attaching satellite tags to certain animals, the scientists also collect blood samples and measure the seals' length, girth, and weight. Once the seals are at sea, the research team receives transmissions from the tagged animals that include location, depth, water temperature, and more. From these data, scientists have learned about the feeding behaviors of the seals. For example, the data show that while at sea the animals are almost constantly diving - they never take a break at the surface. In addition to learning a great deal from the presentation, the ACES students were able to ask Dr. Simmons many questions about her work and the animals. Our next scientist webcast will take place on January 26, 2009 with ACES Scientist Michelle Hester from Oikonos Ecosystem Knowledge. Student Question: How long do they live? How did you get started in this field?